Over the five years prior to its bankruptcy, Enron reported $13bn of income to investors, and $63m to the tax authorities: A 200-to-1 book-tax difference (BTD). The unravelling of Chinese accounting frauds often reveal the grave inconsistency of the revenue and profit numbers in the financial statements and in the tax filings to the Chinese authorities in a “two-book” system. The BTD measure, to be elaborated later, is an overlooked tool to detect accounting fraud, tunneling/expropriation and earnings management risks. The focus on legal institutions has been helpful in explaining cross-country variation in capital market developments, dividend policies, capital allocation, firm valuation, and insider private control risks. However, extra-legal institutions, specifically tax policies, have the potential to expand our current knowledge about corporate ownership and control structures and their associated agency costs. The role of extra-legal institution in mitigating corporate governance risks and limiting insider income management and tunnelling/ expropriation has come to the forefront of the investing landscape in Asia with the controversial tax code revision plan unveiled on Aug 6 by Korea’s deputy prime minister and finance minister Choi Kyung-hwan to buttress the $40bn “Choinomics” stimulus plan. A cornerstone of the tax reform plan is the taxing of the excess corporate cash holdings of companies with the intent to induce companies to tap cash reserves to pay higher dividends, raise wages or invest to boost household income. 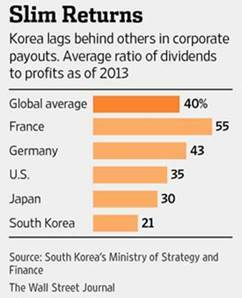 Finance Ministry data show South Korea’s ratio of dividends as percentage of profits in 2013 was 21.1% – about half the world average. The ratio is 34.6% in the U.S., 30.1% in Japan, 55.1% in France, and 43.3% in Germany. Korea now followed the steps of Taiwan who currently imposes a punitive tax on enterprises with excessive idle funds, a move intended to encourage enterprises to release more dividends to shareholders and attract more international capital. The new tax code aims at imposing 10% on companies that do not spend 60 to 80% of their corporate income on investment, dividends and salaries. The new tax code will be applied for three years for corporate income to be generated from 2015. Tax on corporate cash holdings targets companies whose equity capital exceeds W50bn ($48.5m). SMEs will be excluded from the tax code. Around 4,000 companies will be subjected to the new code. 200 KOSPI-listed firms have to pay a combined W331.2bn in tax. To avert the tax burden, they have to spend around W3.3tr ($3.1bn), 10 times higher than the tax, for dividends, investments and wages. Of 200 KOSPI-listed companies, 46 are subject to tax on excess corporate cash holdings. The internal reserves, including cash and cash equivalents, of South Korea’s top 10 enterprises totalled W341tr at the end of 2013. It is estimated that the top 10 conglomerates would have to pay up to W1.1tr ($1.07bn) in extra taxes under the new plan. Samsung Electronics (KOSPI: 005930 KS, MV $178bn) is at the top of the list, with an extra annual tax bill of $360m, though in 2013, it spent roughly 85% of its W30.5tr net profit on capital expenditures and dividend payments, exempting it from the additional taxation. The key to determining the hit on these large companies is whether overseas investment would count toward the expenditure target. The Finance Ministry had not yet decided whether to distinguish between investment in South Korea and investment that occurs overseas. More than half of Samsung’s capex were spent overseas. Some of the unintended ills of this tax policy will be companies mal-investing in real estate or other forms of liquid assets to avoid the punitive tax. Korean business leaders have not demonstrated a good track record in capital allocation. It will be critical for the government to restrict the investments in the tax plan to productive capex, R&D and innovation to widen the economic moat. Perhaps this tax policy can also mitigate the governance risk of Asian controlling shareholders, such as the case of Satyam’s Ramalinga Raju with the “missing” billion dollar cash, from tunnelling or expropriating cash through related-party transactions hidden under the opaque group business structure. Many value investors are attracted to invest in the Asian companies with high net cash in the balance sheet, and some even tried the activist approach to force the owners to disburse the cash through dividend payouts or share buybacks. However, the net-cash in the balance sheet could be a case of “cash equivalent” that are promissory notes or short-term loans to related companies (repayable in say 20 days and classified by the auditors as “cash equivalent”) which are rolled forward and never repaid. It will be interesting to assess the impact of this new tax policy on the performance and valuation of Korea companies. The tax reforms in Korea and Taiwan also reminded us of what the grandmaster in accounting researcher Ray Ball had boldly argued in his Journal of Accounting & Economics paper “Incentives versus Standards: Properties of Accounting Income in Four East Asian Countries”. Ball commented that the East Asian countries of Hong Kong, Malaysia, Singapore and Thailand have accounting standards that are generally viewed as “high-quality” as their standards derive from common law sources that are viewed as higher quality than code law standards, but they have institutional structures that give preparers incentives to issue low-quality financial reports. Thus, it is misleading to classify countries by standards (the “form”), ignoring incentives (the “substance”). Transparency ratings, such as PwC’s “opacity index” (which ranks Singapore higher than US and Britain), are largely based on standards. The School of Accountancy of the Singapore Management University (SMU) has recently partnered with the Tax Academy of Singapore (TA) to launch the SMU-TA Centre for Excellence in Taxation (CET) to produce impactful research in international and regional tax issues for policy development. To guarantee a form of corporate governance that is capable of sustaining long-term value creation, it is critical that firm performance is reported in a true and fair manner so that external stakeholders can monitor their claims and exercise their rights. We hope that future tax research in accounting led by SMU-TA CET can broaden our thinking by integrating the multi-disciplines of economics and finance and incorporating the effects of firm-level corporate governance structures. Like Roosevelt who eliminated the pyramid business group structure by applying double taxation to intercorporate dividends, we look forward to the tax authorities in Asia acting as the additional governance mechanism for the firm in an integral part of the extra-legal institutional fabric. Hopefully, minority investors in Asian companies will suffer less of the abuse of the prevalent tunneling and expropriation risks enacted by the controlling shareholders.